AV Club: Buried deep within the grim worlds of most zombie movies lies an unlikely streak of wish-fulfillment. Granted, a zombie-ruled hellscape offers plenty of disadvantages to the living, but it also includes the giddy promise of a world where the rules have been thrown out the window, and survivors can treat abandoned stores, amusement parks, and homes like their own private treasure chests—assuming, of course, that they don’t get eaten in the process. The winning new road movie/horror-comedy Zombieland runs with this conceit, most gloriously during an extended sequence featuring a mystery guest star indulging in hilarious self-parody. The Guardian: Traditionally, zombie films are valued for their satirical qualities, but this one doesn't aspire to any commentary on our undead commercial society. It does however offer a nice line on Columbus's emotional frigidity and irrational fear of social contact. These disabilities have equipped him with the neurotically alert caution now needed to stay alive: he may have been a bit of a zombie before the apocalypse, but now his humanity has triumphed. A very ridiculous film which is also a treat. NYTimes: The real point and, depending on your blood lust, the pleasure of “Zombieland” is its appetite for destruction. Despite its throwaway jokes, a hint of romance and various ridiculous bits of business, some involving Twinkies, the movie is strictly a compendium of all the ways to off zombies, which can be downed with guns, of course, as well as baseball bats, gardening tools, a toilet-bowl lid, even a piano. Roger Ebert: All of this could have been dreary, but not here. The filmmakers show invention and well-tuned comic timing, and above all, there's a cameo by Bill Murray that gets the single biggest laugh I've heard this year. The foursome hauls up at Murray's vast Beverly Hills mansion, so palatial it is surely a grand hotel, and finds him still in residence. More than that I will not say, except that not many zombie comedies can make me think simultaneously about "Psycho" and "Garfield." Oh man, didn't know this one had made it to Netflix. I really loved this movie. There is sooooooo much truth in Murray's response to "Any regrets?" This movie is awesome. I have to admit, I was hoping Got-My-Oscar-Already Emma Stone would be doing a lot more zombie-killing by now. Excellent movie; rewatched it with my SO’s son the other day to pass it to the next generation. The opening credits sequence showing the chaos of Zombieland in slo-mo, with the credits themselves being shattered or knocked about by the action, is a brilliant gem of filmmaking. 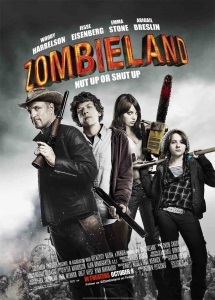 I never saw this movie, but I remember coming out of a movie theater when it was letting out of the next theater - the people who had just seem Zombieland were positively giddy. I don't know if I've ever seen such a giddy audience coming out of a theater before. It made me want to watch it, though my aversion to zombie gore kept me from doing so. But now it's going on my to-watch list. Films where Woody Harrelson is playing a somewhat stoned sage: Zombieland, 2012, The Hunger Games. I'd really love to see him in a film adaption of the Doc Ford series by Randy Wayne White: Captiva, Twelve Mile Limit, Deep Blue. "He spent the summer of 1979 working at Kings Island amusement park." Wikipedia. Oh, boy. The piano scene is almost a throw-away, an aside, and yet I can start laughing just thinking about it. I'm glad I saw this, back in the day, before I read that review that spoiled the cameo, which wouldn't have hit nearly as hard, IMO.